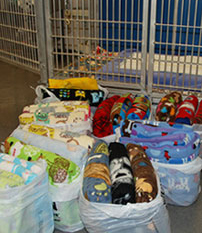 The teaching hospital staff love the cheerful fleece blankets that Diane Ostergaard makes with TLC. The hospital staff look forward to seeing Ostergaard every few months when she stops by the hospital with bags and bags of new blankets. She chooses colorful fleece fabric with animal prints or OSU logos to cheer up owners who are visiting seriously ill pets. “It is payback for all the nice things the hospital staff have done for us,” she says.